STAM Strategic & Partners Group ltd offer specialized training programs for governments, corporations, Ngo, Media. STAM can train & assist in non-conflict support to Law Enforcement, Armed Force and Force Protection. Courses are delivered by qualified former Special Forces, Special Operations Forces and Intelligence Agency Instructors who employ combined doctrines and training methodology derived from contemporary operational experience and approved programs of instruction. English, French, Spanish, Portuguese, Arabic. Provide assistance and support to the civil reconciliation process, in areas characterized by the presence of ethnic conflict, Insurgence activity, terrorism and organized crime. For example, in response to complex terrorist attacks & crime activities, STAM can immediately deploy IMTT (International Mobile Training Team) to secure specialized training to help the Law Enforcement reorganization and specialization. Training program designed to meet the demands of conventional & special forces, intelligence agency assigned to a counter-terrorism role. 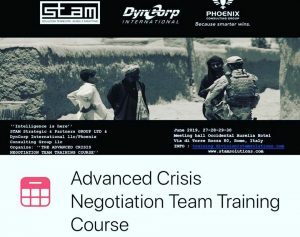 STAM Training division offers intelligence courses using only the support of DynCorp International’s Phoenix Consulting Group llc & international intelligence specialist. STAM provide for the reduction of unconventional armaments within a framework of consensus, development and cooperation. The project is based on the disarmament, demobilization and training of former combatants, to reintegrate them into the new Native Police Force. STAM prepares those about to deploy to areas of increased risk. Teaches extensive personal security measures. The STAM consultants develop training solutions, to prepare the distribution campaign or project manager to fulfill the roles of security focal points. STAM Team is able to build customized training programs for staff working in high-risk environments for NGOs, the media, business organizations, not-for-profit organizations and relief organizations require training related heat under the obligation personnel diligence. For their training programs STAM uses training center in the United States, Latin America and Eastern Europe. STAM Strategic & Partners Group ltd, has an International Mobile Training Team (IMTT) capable of operating at our customers’ facilities. The IMTT STAM is able to operate even in hostile environment and in high risk countries. There are restrictions for the international mobile training team. We do not provide our own weapon systems and specialized equipment without the necessary legal paperwork and governmental or agency authorization.